Beautifully create or restore your chimney to a masterpiece! For over 41 years Nickos Chimney Company has built, repaired and restored chimneys and fireplaces. Your fireplace is one of the most important features of your home. Let Nickos create your masterpiece. Nickos Chimney Company's masonry professionals specialize in repairs to all aspects of your chimney and venting system, including: sealing leaks and cracks in your chimney structure, re-pointing brick, restoration of brick and cement, brick replacement, damper replacement, repairing flue, and chimney cleaning. Nickos Chimney Company is one of the oldest chimney sweep companies in the country. George Spanos, owner of Nickos Chimney Company, is one of the founders of the Pennsylvania Chimney Sweep Guild and a lifetime charter member. Nickos Chimney Company is fully equipped and trained to handle every contingency: from minor to major repairs. Our chimney services include: cleaning, flue relining, replacement and repair of caps, dampers, eliminating draft, water and odor problems, full chimney installation, fireplace restoration and chimney fire repairs. Schedule an in home evaluation to evaluate your chimneys structure. Chimney Caps protect the chimney. They not only prevent rain from falling straight down into the flue system, they also keep debris out. Water that falls into the chimney will increase the rate that creosote glazes and tars. Similarly, any debris brought into the chimney by birds or raccoons can be dangerous. Chimney caps also protect your house from the stray sparks that may cause hazard to your home. Let Nickos Chimney Company install your new chimney cap and remove the unwanted debris from your chimney. The flue system in your chimney is used to direct smoke up your fireplace. Chimney Liners wear out over time and can cause severe problems to your chimney structure and home if not properly inspected or maintained. 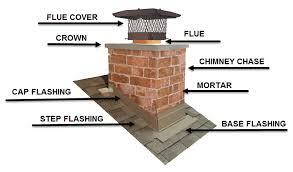 Nickos Chimney Company can evaluate your chimney and recommend the proper solution. Your chimney can be revitalized with a new liner. Over 128 years combined experience is the power behind Nickos Chimney Company. We are equipped to handle every detail, from initial planning to material selection, to amazing design. Nickos will provide you with a masterpiece you will enjoy for a lifetime. Water damage in a chimney is caused by water entering the mortar crown. This is a result of water penetration into the mortar with the continual freeze and thaw cycle over the winter months. Efflorescent - Efflorescence, a powdery white substance on bricks, can indicate a serious problem with chimneys. Moisture moving through bricks causes white mineral deposits on the brick surface and in the case of a chimney, it may indicate that you need a flue liner. Spray the exterior surface of the chimney with Chimney Saver water repellent. It will penetrate deep enough to protect masonry from destructive water penetration.